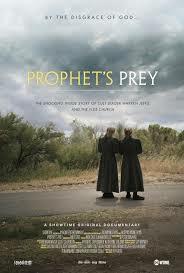 Prophet’s Prey, the quietly terrifying new film from Oscar-nominated director Amy Berg (Deliver Us from Evil, West of Memphis) continues her trenchant investigation of patriarchal abuse couched under the protective guise of religion, and the systemic flaws in our criminal justice system. The acclaimed documentary, which debuted at this year’s Sundance Film Festival, is largely set against the deceptively bucolic scenery of the American heartland. Berg’s focus is the Fundamentalist Church of Latter-Day Saints (FLDS), a polygamous, unsanctioned offshoot of the Mormon Church run by the tyrannical, self-proclaimed prophet, Warren Jeffs. To cover up his sins and elude accountability, Jeff continuously moved around the country, always choosing remote, well-guarded and monitored locations. By sequestering the FLDS members in these deceptively Eden-like settings, he was able to inculcate them and bend them to his will without any threat of outside interference. Though he was placed on the FBI’s most-wanted list and, eventually, captured and sentenced to life in prison, Warren Jeffs continues to prey on the FLDS community in absentia, his power largely unchecked and unchallenged to this very day. Director Amy Berg, the critically-acclaimed, Emmy Award-winning and Oscar-nominated documentary filmmaker joins us to talk about her compelling film and the destructive whims of a manipulative madman. Friday, 9/25, at the 7:15 screening: Dax Shepherd & Kristen Bell will be moderating. Sam Brower and Amy Berg will be on the panel. On Sat, 9/26 at the 4:15 screening: Sam Brower and Amy Berg will be on the panel. On Sat, 9/26 at the 7:15 screening: Henry Rollins will be moderating. Sam Brower and Amy Berg will be on the panel. BRAND: A Second Coming chronicles actor / comedian / activist Russell Brand on his journey from addict, self-proclaimed narcissist and Hollywood star living in the fast-lane to his current, and unexpected, role as political disruptor & newfound hero to the underserved. Criticized for egomaniacal self-interest, Brand injects his madness in to the world and calls for revolution. He stays the course with an irreverent courage that inspires a new generation of activists to rise up against the ever-increasing world engorged in consumerism. Can Brand rise against the roar of criticism from the very system that built him? Does he have the fortitude, resilience and commitment to keep up the fight? Will he find true happiness which has eluded him since childhood? BRAND: A Second Coming takes audiences behind the scenes of this wildly complex man for an intimate look at what drives Russell Brand as he continues to be the consummate disruptor. BRAND: A Second Coming produced, written and directed by award-winning filmmaker Ondi Timoner (DIG!, WE LIVE IN PUBLIC) joins us to talk about getting close to this kinetic, fascinating force of nature. UNBRANDED reveals the true interdependence of man, animal and nature — their 3000-mile gauntlet through five states that is indescribable and unforgiving. Sixteen mustangs, four men, one dream: to ride border to border, Mexico to Canada, up the spine of the American West. 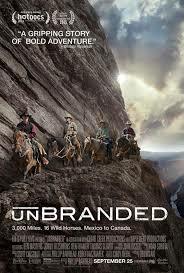 The documentary, UNBRANDED, tracks four fresh-out-of-college buddies as they take on wild mustangs to be their trusted mounts, and set out on the adventure of a lifetime. Their wildness of spirit, in both man and horse, is quickly dwarfed by the wilderness they must navigate: a 3000-mile gauntlet through five states that is equally indescribable and unforgiving. This story of rugged independence reveals the true interdependence of man, animal and nature. As we see first-hand, Ben Masters, Jonny Fitzsimons, Thomas Glover and Ben Thamer, relied upon the incredible strength and energy of mustangs – these wild horses – who had been chosen and trained for this purpose. The group set out to inspire adoptions of the 50,000 wild horses living in holding pens in the American West and to bring attention to the fragile ecosystem and this last uninterrupted vertical stretch of public land in the West. Along the way, the support they receive from others, including a veteran horseman and cowboy poet whose life has been deeply connected to horses and the backcountry, creates a meaningful bond among the men and the animals. Director and co-cinematographer Phillip Baribeau stops by to talk about his visually stunning, emotionally charged plea for the lives of thousands of wild mustangs currently held in stifling captivity. On September 26th, 1983, an alarm sounded to indicate that five American nuclear missiles had been launched against the Soviet Union. Russian Lt. Colonel Stanislav Petrov defied military protocol, ignoring the incoming attack that was being confirmed by all his warning systems. He followed his own sense of responsibility and declared it a false alarm. His decision spared the world a nuclear holocaust. Decades later, this forgotten hero travels to the United States to accept an award from the United Nations and finally receive acknowledgement for his historical act. The Man Who Saved the World becomes a dramatic hybrid documentary; a historical thriller, and a story of great, personal redemption. It seamlessly melds together non-fiction and narrative filmmaking depicting the actual events that took place more than thirty years ago. Stanislav Petrov reminds us how close the world came to World War III – but, he also challenges us to contemplate the true alternative to his choice: The complete annihilation of human life on earth. Featuring Kevin Costner with appearances by Walter Cronkite, Robert De Niro, Matt Damon, and Ashton Kutcher. Director / writer Peter Anthony joins us to talk about a man and an event that has been virtually unknown to the world outside a small circle of people who have long understood the impact Stanislav Petrov’s actions had on the fate of the world. 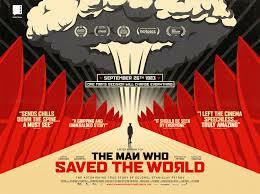 The Man Who Saved the World screens at the Arena Theatre starting Friday, September 25. Change was coming to America and the fault lines could no longer be ignored—cities were burning, Vietnam was exploding, and disputes raged over equality and civil rights. A new revolutionary culture was emerging and it sought to drastically transform the system. The Black Panther Party for Self-Defense would, for a short time, put itself at the vanguard of that change. 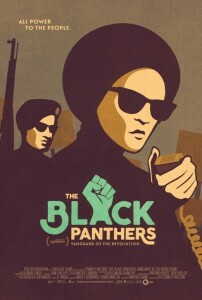 THE BLACK PANTHERS: VANGUARD OF THE REVOLUTION is the first feature length documentary to explore the Black Panther Party, its significance to the broader American culture, its cultural and political awakening for black people, and the painful lessons wrought when a movement derails. Renown documentarian Stanley Nelson goes straight to the source, weaving a treasure trove of rare archival footage with the voices of the people who were there: police, FBI informants, journalists, white supporters and detractors, and Black Panthers who remained loyal to the party and those who left it. Featuring Kathleen Cleaver, Jamal Joseph, and many others, THE BLACK PANTHERS: VANGUARD OF THE REVOLUTION is an essential history and a vibrant chronicle of this pivotal movement that birthed a new revolutionary culture in America. THE BLACK PANTHERS: VANGUARD OF THE REVOLUTION, is the latest film from renowned documentarian Stanley Nelson (FREEDOM RIDERS, THE MURDER OF EMMETT TILL). Director / writer / producer Nelson joins us to talk about the formation of the Black Panther Party, the assassination of Panther leader Fred Hampton, the social unrest that made it a such a influential force in the struggle for political power and racial equality. 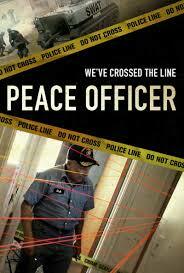 Peace Officer is a documentary about the increasingly militarized state of American police as told through the story of ‘Dub’ Lawrence, a former sheriff who established and trained his rural state’s first SWAT team only to see that same unit kill his son-in-law in a controversial standoff 30 years later. Driven by an obsessed sense of mission, Dub uses his own investigation skills to uncover the truth in this and other recent officer-involved shootings in his community, while tackling larger questions about the changing face of peace officers nationwide. In Peace Officer, these events are contextualized within a growing national phenomenon of violent SWAT raids and governmental immunity laws gone amok in the War on Drugs. Officers both in cities and small towns like Dub’s are routinely armed with military surplus weapons and equipment, and federal incentives to use what they are given. All of this has lead to a 15,000% increase in SWAT team raids in the United States since the late 1970’s. Peace Officer follows Dub as he obsessively picks apart these cases from his unique perspective that combines the zeal of a rule-of-law detective with the grief of a victim. Co-director Scott Christopherson and film subject William “Dub” Lawrence joins us to talk about the history and ramifications of a world where military-inspired tactics and overwhelming firepower are used on people suspected of criminal activity. Opening on Friday, September 18th at the Nuart Theater in Los Angeles with a Q & A after the Friday and Saturday 7:30 PM screening with Director Scott Christopherson and William “Dub” Lawrence. 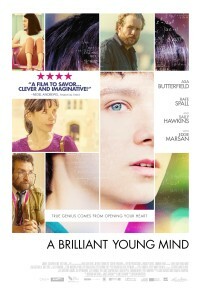 Inspired by true events, A BRILLIANT YOUNG MIND tells the story of teenage math prodigy Nathan (Asa Butterfield), who struggles when it comes to building relationships, not least with his caring mother, Julie (Sally Hawkins). In his confusing world, Nathan finds comfort in the predictability of numbers. And when he’s taken under the wing of an unconventional and anarchic teacher (Rafe Spall), the pair forge an unusual friendship. Eventually, Nathan’s talents win him a place on the U.K.’s National team at the International Mathematics Olympiad (IMO) and the team travels to a training camp in Taiwan, under the supervision of enthusiastic squad leader Richard (Eddie Marsan). Featuring an all-star British cast, A BRILLIANT YOUNG MIND is directed by BAFTA award-winning filmmaker Morgan Matthews and photographed by Oscar-nominated cinematographer Danny Cohen. We are joined by the director Morgan Matthews (Beautiful Young Minds) for a conversation on the inherent advantages of moving from the documentary into narrative filmmaking, balancing multiple storylines and working with a remarkable cast of new and experienced actors.